SCOTTSDALE, Ariz. — Johnny Miller came here for his finale, a one-day Saturday-afternoon sendoff. There was supposed to be a passing of the baton, Paul Azinger coming as Miller said farewell, but this is live TV and you make a thousand decisions on the fly in that game and the news of the day — where can a caddie stand and when can he stand there! — chewed up a chunk of the telecast, and now Azinger will get his NBC introduction on Super Bowl Sunday. Saturday belonged to John. 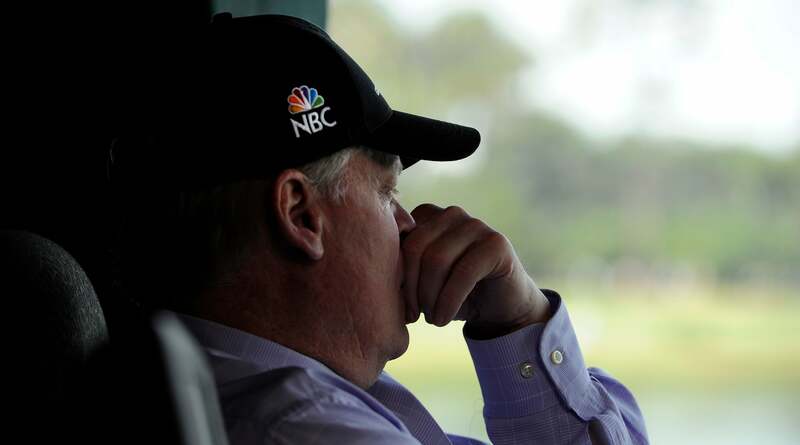 He took his seat in the studio at exactly 1 p.m., local time, occupying the chair that Justin Leonard, handling broadcast duties for Golf Channel, had been in. Leonard wiped down the ear cushions of their shared headset, handed them to Miller, gave him a fist bump and walked off. Meanwhile, Rich Lerner made way for Dan Hicks. This was No. 232 for Hicks and Miller working side-by-side. TV people are like baseball people. There are so many things to count and they count everything. Eyeballs, most especially. Not Johnny, though. He wasn’t part of anybody’s marketing plan. What made him a revered commentator, he said more than once, was this: “People want the truth and I gave it to them.” He was plain and straight. His hero, Jack Nicklaus, is about the same. Johnny Miller was John to Nicklaus, and when Nicklaus paid tribute to Miller toward the end of the three-hour network telecast, the original Mr. 63 welled-up. (Oakmont, Sunday, 1973 U.S. Open; yes, it was wet.) Miller considered Jack’s words while leaning back in a black reclining chair, his legs crossed, lips dry, color drained from his face. Miller could beat Nicklaus, now and again, when they were both at their best. Anybody who can say that has a place in the game forever: Tom Watson, Tom Weiskopf, Lee Trevino, Gary Player, Hubert Green, Hale Irwin. Not too many others. Miller won at Pebble Beach in ’94, has been a golf analyst for NBC since 1990, had three second-place finishes at Augusta, was a whiz-kid amateur at the U.S. Open at his home club, Olympic, in 1966. In other words, he’s been a national figure in the game for more than half a century. His candor and insight defined the golf-watching experience for tens of millions of viewers at hundreds of U.S. Opens, Ryder Cups, Players championships and other golf events, both ordinary and extraordinary. In 2002, when Ken Venturi worked his final event for CBS, Jeff Sluman said, “Kenny’s golf.” Ditto for Miller. Johnny’s golf. Young Johnny, just a few years before he became a phenom on the Northern California junior circuit. Miller made his farewell here at the Waste Management Phoenix Open because NBC doesn’t have the U.S. Open anymore, the Pebble Beach tournament is a CBS event and, for a while there, Miller owned the desert. He won this event in 1974 by a shot and the next year by 14, back when it was just the plain old Phoenix Open. It’s still Phoenix to Johnny. Miller was all about the shots and the players and the pressure. He was all about the golf. That’s why he was so good at analyzing Tiger Woods through the years, even if Tiger couldn’t stand him. Golf has morphed into a different thing, golf-on-TV, and that’s OK if you think of the sport as entertainment. It was not entertainment for Miller. It was asking his longtime caddie, Andy Martinez, if the yardage was 172 or 173. This Saturday broadcast was not anything like vintage Miller, except for the commercial-break moments when he mainstreamed Cheez Whiz straight into his mouth, washed down with sips of Coke from a can. He was watching the golf on several different screens, legs crossed, leaning back, silent for long stretches. You could see his mind was a million miles away, and Hicks, his sidekick for nearly 20 years, brought him back in now and again. Two guests came in to the white-tented booth behind the 18th tee to meet Hicks. “Johnny, let me introduce you to these guys,” Hicks said. Miller was making his way out at that very moment. “I gotta go use the little boys’ room,” he said. Nicklaus uses the same phrase. All through the broadcast, their backs faced the 18th tee, and now and again, but not often, Miller turned around and looked through the three large picture windows, not a smudge on them. Down below was the Stadium Course at TPC Scottsdale and the players on it. One of the cameramen, returning from a bathroom break himself, said, “It’s getting nasty out there.” It was not a weather report, but a statement on the level of spectator inebriation. Miller’s gaze went in the direction of a lone bird flying over the manmade pond left of 18, with a rock border and the words WASTE MANAGEMENT floating in it. He looked at an electronic leaderboard in the tower and some shiny names — Rickie Fowler! Justin Thomas! — practically popping off it. Hicks made a comment about Rickie and JT sharing housing this week near the course, and Miller gave the news just a hint of a smile. He was Rickie Fowler. He was Justin Thomas. But that was a long time ago. The telecast — the NBC telecast — ran a spot that included the familiar Augusta National logo. You never see that logo on a network that doesn’t have a giant eyeball for a logo. But this was for the Augusta National Women’s Amateur, an NBC Sports property. Watching the spot seemed to brighten Miller. He wished he would have had just once chance to call a Masters. Miller has been in the booth for NBC for nearly three decades.